Every visit, every customer, every time. 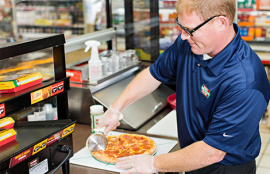 Our Account Managers do more than deliver supplies for your Hunt Brothers® Pizza business; they also provide marketing advice, help with staff training, and even help keep your facility clean. We’re in this together with our customers, and we consider every Account Manager to be as much a part of your team as they are a part of ours. We demonstrate that commitment on-site every day with our promise to our partners. 1. We will keep your gas pumps visible and accessible at all times, taking care not to block your pumps with our trucks. 2. We will check your outdoor signage and replace as appropriate. We’ll also pick up any parking lot litter on our way in the door. 3. We will greet you, eye-to-eye, as your business partner. 4. We will check your Pizza Shoppe for fresh product. If time permits, we’ll make the next pizza while we’re there. 5. We will check the oven and other equipment for cleanliness and alert owners and/ or managers to any potential issues. We’re in this together with our customers, and we consider every TBHC Delivers Account Manager to be as much a part of your team as they are a part of ours. 6. We will keep you informed of new products, limited time offers, and other special promotions that will help keep your Pizza Shoppe business fresh. 7. We will check indoor advertising and replace it as needed. 8. We will conduct a beginning inventory and print your order for your records. 9. We will bring your order in from our trucks. 10. We will physically check-in any new product ourselves with the owner and/ or manager. 11. We will rotate toppings and other products, and put new supplies away for you. 12. 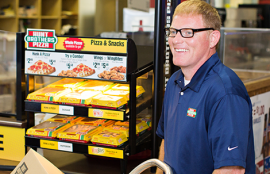 We will offer to train or refresh employees on any of Hunt Brothers Pizza’s processes when needed, as time permits. 13. We will work with you on ideas to boost sales and give actionable suggestions for growing your Pizza Shoppe’s profitability when needed, as time permits. 14. We will ask, “Is there anything I could have done better to serve you today?” at the end of every visit. 15. We will take out the trash on our way out the door.